Warning: The following review contains some content that many would consider to be spoilers, mainly because it is hard to discuss this film without giving a lot of the story away (especially the ending). So if you haven’t seen this movie, just go rent it right now based on this sentence alone. When I was younger, I was one of those kids who thought I could free the miniature people trapped inside the TV set. Luckily, my parents never let me play with a hammer. Woody Allen probably never had a hammer either, but he did have the ability to write a superb script. “The Purple Rose of Cairo” combines Allen’s gift for realistic fantasy story telling with chaos theory. The result is one of his finest films. Cecilia (Mia Farrow) is a wishful thinker and a bit of a dreamer. That might be because she lives in Depression era New Jersey (any era New Jersey would probably be bad enough), has an abusive husband (Danny Aiello), and works a dead end job as a waitress which she is eventually fired from. Things like this would want to make anyone want to escape into the comfort of a good movie every single day. Cecilia frequents the action-adventure-romance picture “The Purple Rose of Cairo.” Enough is seen of this movie’s story that “The Purple Rose of Cairo” becomes a movie-within-a-movie with the movie within it also being called “The Purple Rose of Cairo.” Hope your head doesn’t hurt too much yet, because the main character of the movie within a movie, the explorer Tom Baxter (Jeff Daniels) literally walks off the screen and into Cecilia’s life. Tom is the kind of man that could only exist in Cecilia’s dreams: he’s strong, brave, and romantic. Meanwhile, she’s used to a weak-willed alcoholic. The best part of this whole act is that there is absolutely no explanation for it. It is similar to the way that Allen goes to no length to explain Gil’s ability to travel back in time in “Midnight in Paris.” Save the science behind it for a J.J. Abrams movie. All that matters to Allen is the ensuing reactions if seemingly impossible situations such as a movie character coming to life were to happen to an ordinary person. In accordance to Chaos Theory (sorry, there has to be at least a little background philosophizing here), the movie-within-a-movie’s story cannot go on without the presence of even a minor character such as Tom. This leaves the characters in the movie within to partake in much philosophical kvetching. Meanwhile the actor playing Tom, Gil Shepherd (Daniels, again), is left to ponder his next career move after this debacle occurs, and he eventually, like his own character, finds himself falling for Cecilia after they meet. “The Purple Rose of Cairo” might be Allen’s saddest movie. Well, almost every one of his movies ends on some sort of note of melancholy. However, this is one of the few that leaves its protagonist with too many problems and too little hope. Maybe the funniest thing about this movie is that even though it tells us that movies provide the best form of escape, the bigger movie itself is as far from escapism as possible. This is a movie that tends to also be really funny at times. I love the way the characters attending the screening of “The Purple Rose of Cairo” interact with the characters on the screen. Everyone is so surprised as to what as happened, but no reacts in any over-the-top way. Reacting as little as possible to a situation that requires a more emotional reaction is always funny. Escapism is okay as long as we know that we are escaping into a realm of fiction, and not into a realm of reality. 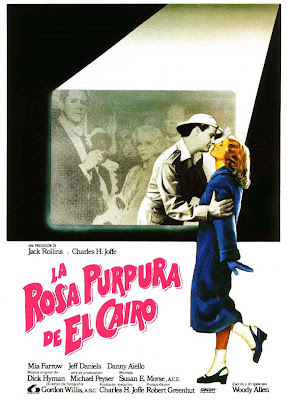 “The Purple Rose of Cairo” is a great black comedy about the absurdity of reality. Every one of its characters, even the minor ones, are memorable in some way. Farrow steals the show as the abused mess of a woman, and she is absent of the high-pitched shriek voice that she would have to take on two years later in “Radio Days.” She also owned the ukulele before Zooey Deschanel and her army of hipsters decided to take it over. Daniels also gives my favorite performance I have ever seen him in (“Dumb & Dumber”) in two different roles, one being the overly confident pseudo-intellectual that Allen so frequently mocks. The scene in which Tom Baxter first jumps off the screen, even by today’s standard of special effects, still feels magical and jarring. Maybe it is the way he so suddenly changes from black and white into color. The conclusion of “The Purple Rose of Cairo” is one that is beautiful even in its sadness. Cecilia seems to have become more self-aware, yet she remains just as sheltered by the cinema. After Gil leaves town without telling her and she realizes her husband won’t change, she returns to the theater and watches Fred Astaire and Ginger Rogers dancing with a sense of both desolation and wonderment. Perhaps it was at that moment she understood that that was the best her life would ever get: to sit inside a theater and watch two people who don’t exist feel a sense of happiness that she would never get to feel. Maybe every once in a while, being drawn in by the flashing light of film from a projector can be a good thing. It can heal wounds and make the pains of life feel just a little bit better. 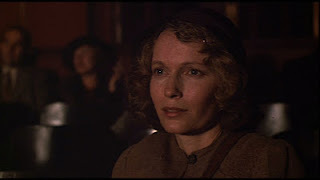 This entry was posted in Mia Farrow, Movie Review, The Purple Rose of Cairo, Woody Allen on January 12, 2012 by ian0592.